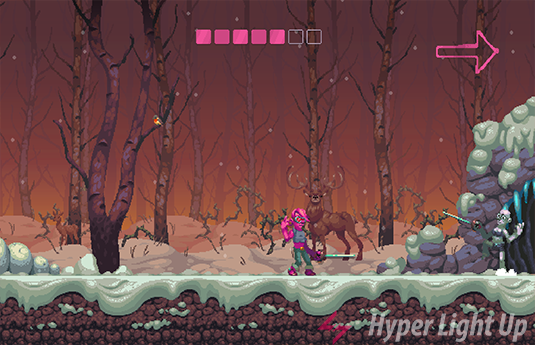 If you are a player who enjoys party games with your friends then there is a huge possibility that you stumbled upon the first Nidhogg, a pixel art fencing game by Messhof. The game was an indie hit with a very enjoyable gameplay that offered us here in Hyper Light Up lots of crazy moments on stream. Finally, the successor is released. Let’s see how it compares with the first game. For those who have no idea about the game, let’s say that Nidhogg 2 is a fighting/fencing game that can end friendships. You begin at the center of each stage and your goal is to kill your opponent and run to the final screen. Only the player who did the killing has the right to run, the other player must defend and try to manage a lethal hit in order to be able to run to the opposite side. The player who passes first the final screen gets eaten by the Great Worm Nidhogg and wins. There is a lot of back and forth in the game, the mind games between the players, especially between friends, can create amazing plays that can end in moments of rage and total enjoyment. The moment we got the game in our hands, we streamed it, since the first one was played very often in our streams. You can watch it here but because of some technical difficulties you can only hear my rage. The gameplay is there though and you can definitely understand how intense it can be. The biggest change of the game is the visual style. With Nidhogg 2 we see a departure from the low res pixel art of the first game that brought to mind the Atari 2600 era and instead we have high res pixel art with lots of detail to the characters and backgrounds that resembles a lot of the claymation style. I admit that when i first saw the announcement trailer and the screenshots of the game I wasn’t impressed. The good thing is that I changed my mind the moment I played the game. You see, the most important thing in the first Nidhogg was the gameplay and that’s where all the fun moments originated. Now, we have a more detailed environment and characters, and every kill is as gruesome as it should be, making a successful hit even more enjoyable. Thankfully the gameplay stays mostly at the same high level and the visual style adds another level to the grotesque world of Nidhogg. 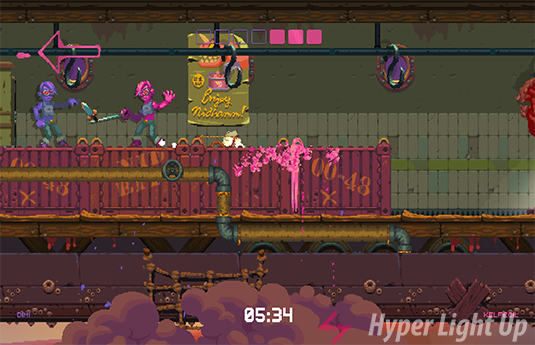 There are ten very detailed stages in Nidhogg 2 and if the gameplay wasn’t so frantic, you could spot a lot of interesting details in the background. The areas you fight are varied too, from snowy stages with platforms that rise and fall to the rainbow clouds and a nightclub in the depths of the sea. As far as the foreground where the fighting happens, I would like more variety that can help with strategies and change the tide of fighting. There are a couple of elevated places and doors but there could be more obstacles that the player should take into consideration when fighting. Another very nice addition is the different weapons the player can have. Besides the all time favorite rapier, there is a knife, a broadsword and a bow that you can use. All of them have their pros and cons, for example the broadsword can disarm the opponent but has no hitbox so if you fall on it, you won’t die. The bow at first seemed like a broken item to me, since you can fire from a distance and your enemy should guess if you are aiming high or low. In a fast game like Nidhogg 2, these lightning fast decisions often end in failure, which can induce rage moments. The fact is that the bow is a weapon that the player needs to learn how to defend against. It takes some time to pull the string and also if you point your sword the correct way, you can reflect the arrow thus sending it back to its sender, which makes for very fun kill moments. 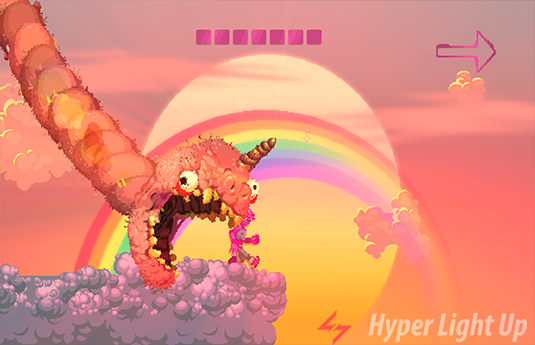 The addition of the weapons sees Nidhogg 2’s departure from the simplicity of the first game, where both players fought on equal terms. The good thing is that there are mutators in the game that allow you to have only one kind of weapon, plus some other pretty fun additions like low gravity and baby mode. Besides the mutators, there aren’t enough game modes to keep the interest up. There is only one single player mode, arcade, where you play through the ten stages against the AI and learn how to use your weapons. Your only goal is to finish fast so you can get into the leaderboards. Then, there is the local mode where you can play a one versus one or a tournament of eight players and the online mode where you can play against other players over the internet. I know Nidhogg 2 is a party game and it offers lots of enjoyment if you play against friends, but you can’t have a party every night and when all this “new game excitement,” that is waiting in my hard drive, fades away, you will end up with a game that you have no reason to load because you won’t get much out of it by playing it alone. The online mode offers ranked play but you can’t see any leaderboards or what your rank is. Honestly it feels like a mode that was rushed and might be properly implemented in the future. The music depends highly on preference and if you liked the minimal electronic soundtrack of the first game, you will enjoy this one too. Personally it is not my cup of tea and I had it turned way down, with only the sound effects loud enough to hear and feel the hits and blood splatter sounds. To tell you the truth, the game is still so much fun if you play with friends. What made the first one a success I believe was the fact that you had your friends next to you or over voice chat and you could listen to their screams, their loud laughs and how angry or excited they were. A pure party game. The same thing happens with Nidhogg 2, it offers all of that, once again, but mostly if you play it with friends. I played alone with a few players online and the awesome comebacks felt like they lost their magic. I laughed hard at one good play over my screen and then immediately I realised I was alone with no one to listen to my reactions. I thought to myself “That doesn’t feel right”. I feel like the developers could do so much more with Nidhogg 2. The first one was minimalistic in all the sense of the word, from the visual style to the game modes, but it offered something fresh. Nidhogg 2, even with the visual style improvement and the weapon additions, feels like more of the same. I see no reason to play it, other than when we stream and that’s a shame. Maybe a few single player modes or an actual ranked mode would make a huge difference. You can buy Nidhogg 2 on Steam at 10% off for the price of 13,49€. Nidhogg 2 has a few improvements and additions over the previous one but in the end it feels more or less the same as its predecessor. The gameplay is intense and even though you will have to get used to all of the different weapons, this is still a totally enjoyable party game. But only if you play against friends, If you want to play alone you won’t find a lot of things to keep you interested in it.